You might have heard of Teasia. They're a well known brand that offers a huge variety of teas, known for being high quality. 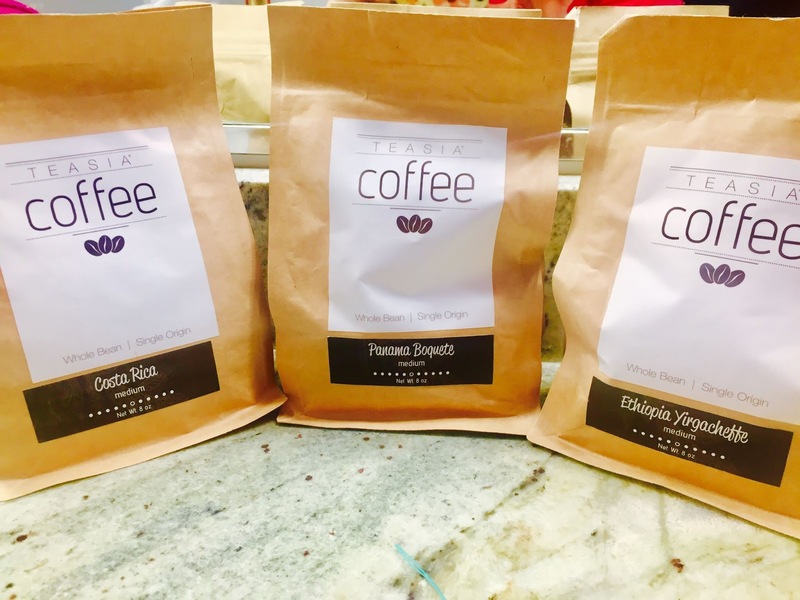 I've actually shared about their k-cup variety pack before which my family loves, so I was very excited when Teasia contacted me about their latest product. I was sent three different varieties of their whole bean coffee to try out. Costa Rica - Coffee from the interior mountains of Costa Rica are known to be relatively heavy-bodied with a complex and fragrant aroma. It is grown in high altitutes and has a lively taste with high acidity. Smooth body with high acidity - chocolate flavor is highlighted with caramelized sugars with surprising hints of tangerine and cantaloupe. Panama Boquete - The area of Panama where these coffee trees grow has the ideal growing climate - increased precipitation and shade protection. Due to the humid conditions and ample shade, the coffee beans develop at a slower pace making them much more flavorful. Crisply acidic with a light slighty earthy body and fruit flavors such as cherry, peach, and orange with an undertone of cinnamon. Ethiopia Yirgacheffe - Known as some of the highest quality Arabica coffee beans in the world, Ethiopian Yirgacheffe is known for its high quality unique fragrance and distinctive flavor. Bright acidity with an exotic flavor of spice and herbs and clear floral notes. Trying each of them, I was absolutely impressed. The quality is superb, and I honestly can't pick a favorite blend. I'm not the only one who thinks that either. On the amazon listings for their coffee there is nothing but good reviews, and happy customers. Teasia is offering prizes for two lucky readers. Continental U.S. Entrants Only Please, One winner per residence please. Does not qualify for entrants who has already won a Teasia giveaway.